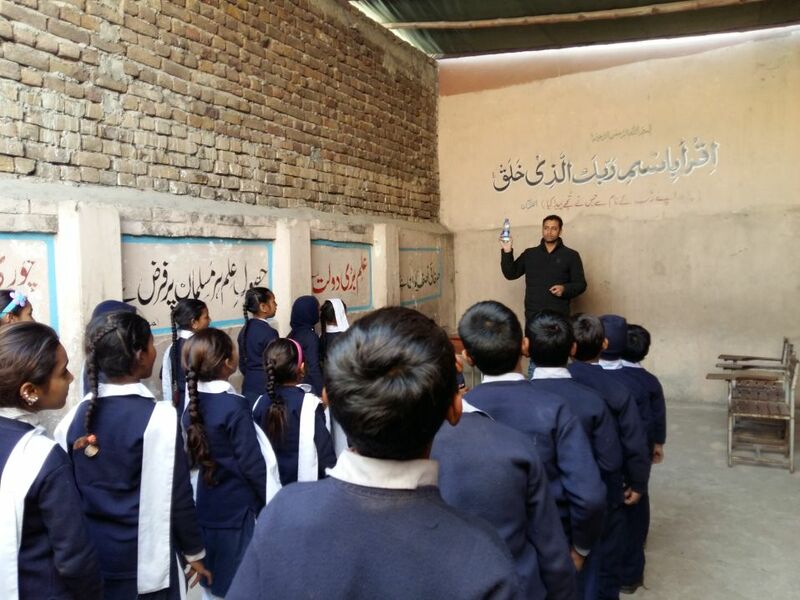 RAHMA SBM School staff organized an activity on earthquake awareness and told students that how to stay safe in different situations. The urban slums of Pakistan are one of the most deprived and unprivileged communities. In the twin cities of Islamabad and Rawalpindi, there are 32 slums. Most of these slums are inhibited by gypsy community that depends on begging as their source of income. These men, women and children can be seen all day long on busy roads and boulevards, begging for money in scorching sun or chilling winters. Although these gypsies have been living for more than 2 decades in these slums, the land is not owned by them. Hence there are no schools for them, or any hospitals. RAHMA felt the need and with the help of Individual donors, launched a project for education in slums of Rawalpindi. To start educational services, a small building, located in the slum was renovated with civil work and furniture for students. Building is donated by local community to promote education in slum to change their future life style. Classes were formally started in 2011 with the induction of 25 students in Nursery class. At the beginning, parents of these students were mobilized towards education which resulted in a positive manner and made them agreed upon to be a part of this initiative. The area located towards East of Mureer Chowk, right between the Railway Line and IESCO Hospital is inhibited by gypsies in the form of mismanaged slum. Such slums are scattered across the entire city and gypsies are living in these slums. These gypsies are second generation immigrants from areas like Multan, Khanewal, Bahawalpur, Rahim Yar Khan and other parts of southern Punjab. Most of these gypsies are involved in begging and drug dealing for their survival. Very few of them work in homes, factories and workshops for earning their livelihoods. The houses are make-shift, the sewerage lines are non-existent, and electricity is available only in some of the Jhuggies. There are approximately 120 Jhuggies in this slum and a population of around 1,200. Very few of the gypsies send their children to school for education. Majority of the children assist their parents from an early age in earning money through begging. This slum school is working towards spreading the light of knowledge and wisdom among the gypsies, who are very unprivileged and neglected part of our society. RAHMA provided technical education to 500 individuals from 2009 to 2010 at Rifah Technical Training Institute in gharibabad, an underprivileged suburb of Rawalpindi. Technical education enabled the girls and boys to enhance their income opportunities. Over all scope is appropriate to address the rising demand for skilled labour and technicians. Technical and vocational education can contribute to such progress, both y reducing unemployment, through creating employment in the fields of pre-vocational specialization and self-employment, and by engendering a higher propensity for labour force participation at the end, improving productivity, and correspondingly resulting in higher graduate earnings. Recognizing the needs of disadvantaged women, we are specially focused on training for women the attracted women for skills training and enhancing their employment opportunities.